The source of the nauseating L train smell that has sickened multiple riders and workers this week may be an abandoned diesel tank buried under a former gas station in East Williamsburg, according to an MTA official. The tank lies near the train tunnel beneath the intersection of Metropolitan and Bushwick Avenues, and holds oil that may cause nausea or headaches. "It's consistent with diesel No. 2 fuel oil, which is what's used to heat homes," the official said. Since the noxious smell first appeared on Monday, L train riders have reported symptoms including fainting and vomiting. Several MTA conductors told us on Thursday that they were experiencing nausea and headaches as a result of the stench, which they said had not improved in four days. A spokesperson for TWU 100 told Gothamist that they're removing some workers from the "odor zone," while a Brooklyn Councilmember Stephen Levin has called on the the MTA to replace L train service with shuttle buses until the issue is resolved. The state Department of Environmental Conservation discovered the potential source on Thursday, though its role in stinking up the L train has not been fully confirmed, the MTA official said. A spokesperson for the DEC did not respond to Gothamist's request for comment. Meanwhile, MTA security chief Bobby Diehl told the Daily News last night that the smell may have also originated from a massive oil spill in Greenpoint, which dumped around 20 million gallons of liquid petroleum into the area over a period of decades—and resulted in a $25 million settlement with Exxon in 2010. Experts have also floated a similar hypothesis, pointing out that the oil plume is believed to be moving south from the initial spill site near Newton Creek. "It can be expected that this contamination is further carried away, and certainly the tunnel where the odors occurred is not so far away from the spill site," Dr. Markus Hilpert, an associate professor of environmental health science at the Mailman School of Public Health at Columbia University, told Gothamist. He added that the "big question" has to do with the concentration of toxic chemicals in the air inside the tunnel. On Thursday, a third-party investigator hired by the MTA performed an air quality assessment on the tunnel between Bedford Avenue and Grand Avenue, finding no presence of volatile organic compounds in the air, according to a letter shared by the MTA. According to the Indypendent, MTA crews have also "power hosed the roadbed and laid down 'Oil-Dri' absorbent blankets to remove oil-stricken water from the station." But Hilpert notes that the fuel leak may prove difficult to clean up, regardless of its initial source. Toxic chemicals within the oil are typically hydrophobic—meaning that they can't be easily washed away—and will often attach to sediment, in this case the walls of the tunnel. "If you have a contaminated soil on the surface of a landscape you would excavate it, but that’s not so easy in a subway environment," Hilpert added. "It could be a major technological challenge to deal with that." 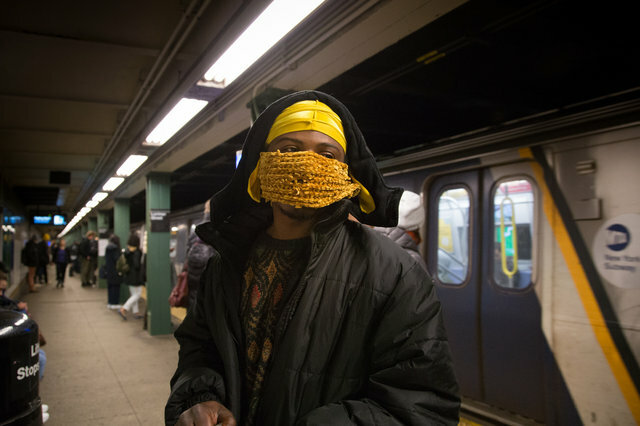 As of Friday morning, riders said the pungent smell continued to linger inside the L train. "Safety is our number one priority and we continue ongoing monitoring of air quality to ensure riders and workers are not at risk. With ventilation measures effectively working to control odors and ongoing cleanup efforts successfully removing the oil from the area, we are now focusing on identifying and cleaning up the source of the oil. We will continue to work throughout the weekend and will provide additional updates as they are available. We recognize the odor can be unpleasant and apologize to riders and employees." So far, the agencies have placed 20 large portable fans to help ventilate stations and plan to add more as needed. Additional reporting by Jen Chung.